Valve isn't on the list, presumably because it isn't public. Any ideas where they would be on the list? It further incentivizes people to keep making posts that Reddit's audience likes. Getting gold is somewhat desirable, but actual money is useful to you. I'm convinced that YouTube and Twitch have much more content today than they would have if they had never added monetization for content creators. Similarly, I wonder if Reddit tipping could result in people (or more people than already) posting to Reddit for a living. Are you on mobile? Imgur always redirects to the full page on mobile unless you do extra URL trickery. 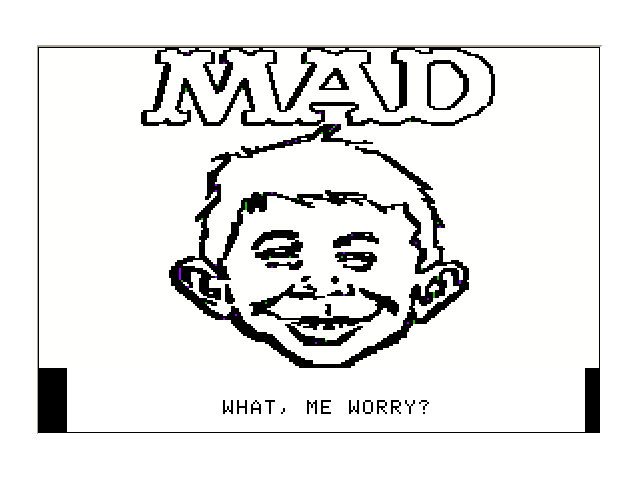 I've never used it before, but you can download it from an old version of the page on the Internet Archive here. Have you tried emailing him at the address on the archived page? On a different note, I'm a little surprised such a stub-like Wikipedia page survived for so long and has met the notability guidelines. What makes you want to filter out users? I'm curious because a lot of the possibilities I come up with could probably also be covered by the upcoming trust system or by proper tagging. It's been pretty empty, I was the only regular player AFAIK and I haven't been on in a week or so, so he may have just shut it down. That's a shame, IMO Gamepedia is much better than Wikia. I hope they learn from what Gamepedia does better, rather than just migrating Gamepedia sites over to Wikia, but I don't think they will. For those who want to see the original output but don't want to run Flash or install AppleWin, here is a screenshot of the end result. How would I go about identifying OLED screens that are or aren't pentile (assuming I'm going off online information)? I don't believe that is usually listed in product page device specifications. In my area (in the US) we just turn off the porch lights and we don't get much of anyone coming to our door. Are the kids more insistent in your area? Isn't it? You want a quiet night in, but instead you've got a steady stream of children turning up at your door asking for lollies. I much prefer to own my music, though there's some stuff I stream from youtube that I plan to buy eventually. No one blames you for being unable to afford something better. I hope you can afford one soon, it makes a big difference IMO. I've got a G710+ with Browns. It's the only mechanical keyboard I bought for myself so far, but I would like to get a slightly smaller 100% with Blues sometime. I've only had a short experience with an MX Blue keyboard, but I liked what I felt. What insight do you believe it's intended to convey? I'm rewatching One Punch Man one last time before it leaves US Netflix (on the 20th, IIRC). I have yet to read the manga, so I may start that after this rewatch. The author seems to think that I would be happier working multiple full-time minimum wage jobs pouring coffee and spending all my free time reading philosophy. I already have I one job making little above minimum wage outside of STEM, and I hate it. It's one of my biggest motivations for pursuing my degree. Don't get me wrong, I understand that many people have had horrible experiences with STEM. Feel free to fee live your life however you want, I won't judge you. However, I can't sympathize with sometime telling me that my desires and values and strengths and weaknesses are objectively incorrect. The insults and name-calling and perpetuation of negative stereotypes don't help either. C++ solution. Grid is hardcoded, but if you wanted you could add the ability to take in input without too much trouble. The code assumes the rows can be variable-length, so there's a bit of inefficiency in checking lengths for each row. I like LockHunter, it adds an item to a file's context menu that allows you to see what's locking the file and lets you kill all of the processes locking it at once. Works with folders too.